We hear that the remaining trestle at the Wye in Delta, Pa. may soon be coming down. Meanwhile, up in Red Lion, I hear the trestle there may be preserved. Two different ways of thinking, I guess. It's all rumor, though if you like looking at old bridges & ditches (or anything MA&PA related), this may be a good time to go and examine the thing. I'll leave it to you, clever reader, to find it. wow! Great old rr photo from 1949! Wish we could have seen trains riding those rails. Don't know why they can't leave any of the old stuff for us to see. Glad we're documenting it before it's all gone! That's the last MaPa trestle standing, isn't it? Besides for Delta & Red Lion, I think the rest are gone. 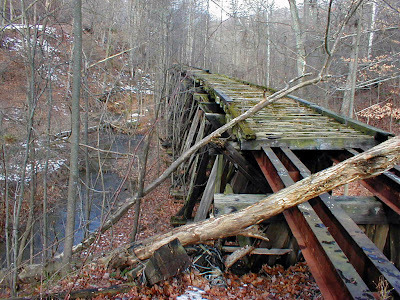 There's that old coal trestle in York, but I think that was from the Western Maryland Railway. 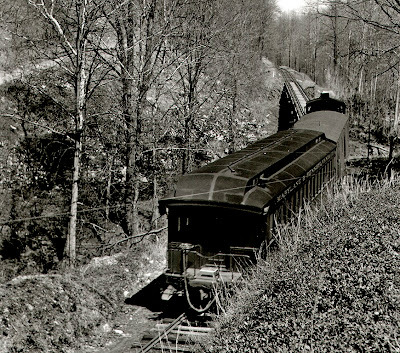 Speaking of the Ma & Pa, whereabouts did the trestle near Vale align relative to Carrs Mill and Vale roads? I've never been quite able to figure that out. It's near Watervale & Vale. You can still see the piers in the winter if you look closely. The line followed Vale Road, not Carrs Mill Road. Correction form last comment: The line followed Watervale road down from Fallston Station. The bridge was between Watervale Road and Vale Station, but closest to Watervale.